All that glitters may not be gold, but these shiny—and sustainable—baubles are guaranteed to make spirits bright this holiday season, no regifting necessary. Here, we present 10 artisan-made jewels to adorn the ones you adore. You don’t have to be a magpie to feel the draw of a peek of glitter or a sliver of shine. We’ve padded our virtual nest with no less than 10 ethical and sustainable jewels for the person at the top of your holiday gift list—which could be you!—from hammered recycled-gold rings to gothic-inspired necklaces woven from black lace. 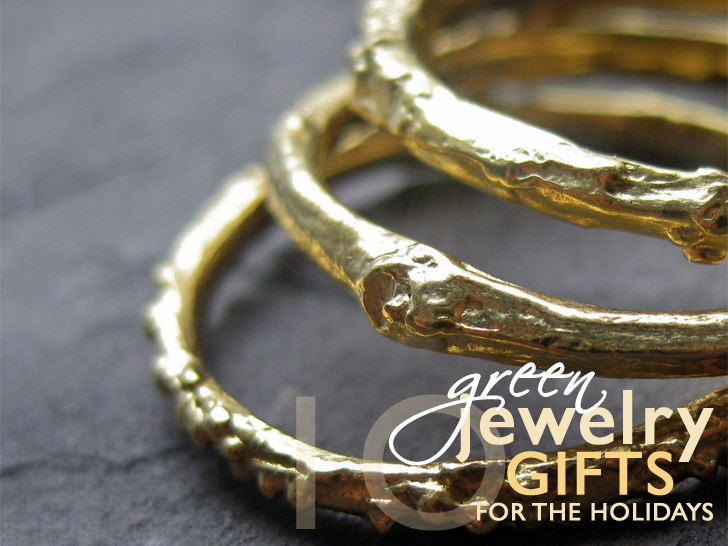 For more eco-friendly gift ideas, visit the Inhabitat Green Holiday Gift Guide. 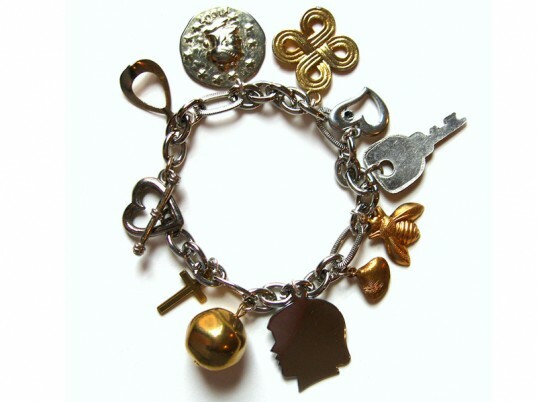 Susan Domelsmith of Dirty Librarian Chains gathered an assortment of dainty adornments, plundered from a dozen vintage necklaces, to create this charmer of a charm bracelet. A pair of black-and-silver intaglio pendants, forged from recycled stainless steel, are suspended from two lengths of gold or sterling-silver chain, along with artisan glass accents that recall the mystery and tenacity of the deep-sea oyster. Earthy-chic gets the glamour-puss treatment with Kristin Coffin’s solitaire sparkler. Cast from an actual twig using recycled 14-karat gold, the ring sports a natural cognac-brown diamond, snugly nestled in a bezel setting. What better way to say you’re caught in someone’s gravitational pull than with Smart Glass Jewelry’s limited-edition Orbit? Composed of a small recycled-glass ring nested inside a larger ovoid (derived from a hand-blown gray bottle), the necklace offers an arresting silhouette that’s simply out of this world. Jewelry impresario Julia Failey teamed up with the Manuary Charity to create this pair of handlebar-honing cufflinks to benefit the Prostrate Cancer Foundation. All proceeds from sales of the hirsute accessories, which are made from reclaimed sterling silver, will go directly to the charity. A timeless classic-in-the-making, this bracelet by Jaros Designs includes cut crystal strung together on antique brass wire for vintage authenticity. The inexpensive price? Huge bonus. Victoriana takes a spin on the turntable with Wrecords by Monkey’s cameo-inspired earrings, derived from recycled vinyl records. Available in three variations (vinyl on beige acrylic, vinyl on vinyl, or vinyl on cherrywood), the anachronistic baubles each hang from findings of sterling silver. A quintet of faux feathers, cut from sumptuous 100 percent merino wool felt, dangles winsomely from a 14-karat gold-fill chain. Bonus: The warm pewter hue coordinates with everything. Amp up the drama on any outfit with White Owl’s gothic Indira Lace Bib, fashioned from teardrops of repurposed ebony lace and embellished with vintage copper findings.